Earlier, his defence barrister asked the Paralympian to remove his prosthetic legs in the courtroom during his sentencing hearing in Pretoria. Barry Roux told the court the man they were looking at, standing on his stumps, was the man who was scared for his life at 3am, and thought an intruder was in his home. The double-amputee's manslaughter conviction was overturned last year by an appeals court, which convicted Pistorius of the more serious charge of murder following the death of his girlfriend Reeva Steenkamp in 2013. I watched it and, yes, he was lying. He's a loathsome, self-serving brat. He fake-blubbed through it, and only managed to squeeze out one single tear. At one point, he rubbed his hands over his face so that his stringy spit looked like tears. He's shitting himself about going back to prison. He meant to kill Reeva. Even if some misguided judge finds otherwise, he meant to kill someone. He shot to kill. I can't believe how transparent he was. The lady Judge has messed up already in this case so surely she won't be taken in by Pistorius a second time. Hopefully he gets 15 years for what he did. Anything less will be a miscarriage for sure. As for the interviews with ITV, they should not have be allowed. Why a convicted murderer is allowed bail is beyond me, let alone being allowed to give TV interviews. The SA system is crazy! A reminder for all who have been following this case that Oscar Pistorius will be sentenced tomorrow. The murder conviction is sound in my opinion regardless of who the victim was. For the sake of argument, even if we believe him for a moment that he thought the person in the toilet was an intruder he did not have the right to shoot them to death. His story is a bit like the toilet door, full of holes. Oscar Pistorius sentenced to 6 years in jail for the murder of Reeva Steenkamp! Yes, that right, Masipa has done it again and given murderer Pistorius a sentence much lower than that of the15 years minimum set down by South African Law. It seems life is extremely cheap in SA and especially so if you are a white athlete. That sentence is an insult to victim Reeva Steenkamp and to justice. Pistorius could now serve as little as two years in prison for the murder of his former girlfriend. Judge Masipa told the Court that Pistorius has lost much and had shown great remorse! Before being taken down to the cells. Oscar Pistorius sentenced to 6 years in jail for the murder of Reeve Steenkamp! 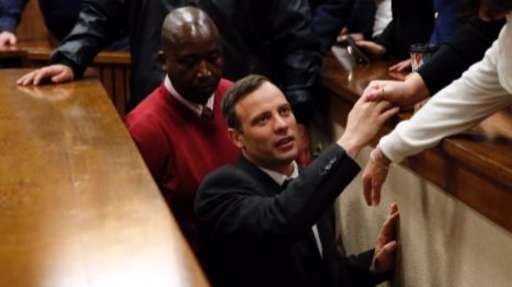 Yes, that right, Masipa has done it again and given murderer Pistorius a sentence much lower than that of 15 years minimum set down by South African Law. I hope the prosecution appeal for a higher sentence. Masipa seems to have a thing for Pistorius. What doesn't she get about him deliberately taking a life. Even now, he may only serve 3 years. Masipa said Oscar was remorseful?! He still claims he thought she was an intruder. If he was truly remorseful he'd admit he killed her deliberately, like the rest of the world know he did. Even it had been an intruder, he had a lethal weapon in his possession, he shot to kill. This case has gone from bad to worse, it has rendered the South African justice system a laughing stock. Masipa is unfit to exercise her commission as a judge in my opinion. I hope the prosecution appeal her decision yet again and she is sacked. 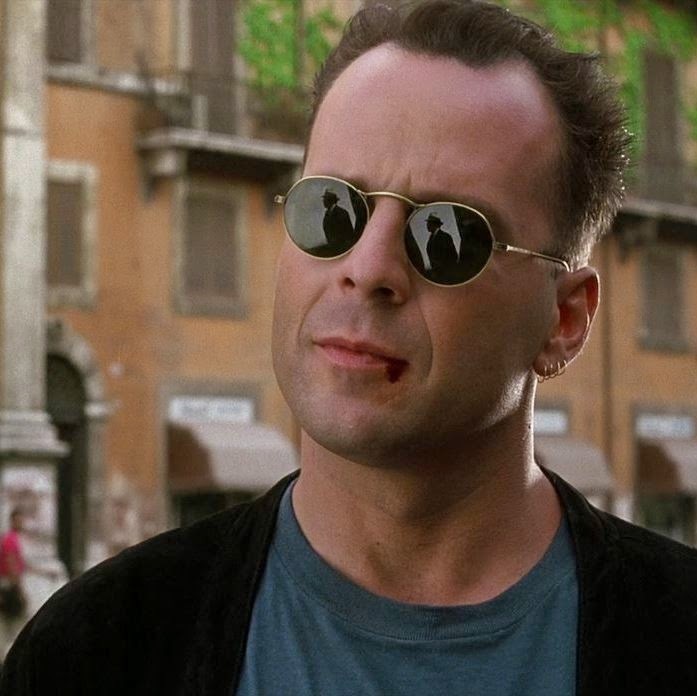 The only person Pistorius feels remorse for, is himself. The judge was worse than useless. 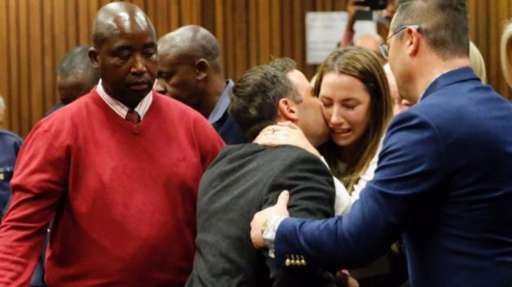 A fair comment, "Human rights barrister Adam Wagner wrote on Twitter: "Why has Oscar Pistorius been given six years for murder if he got five for culpable homicide?""